Each night you'll be staying in charming guesthouses, hotels***, and sumptuous castles or wine châteaux in the heart of the vines. They are 3 star equivalent in quality offering authentic and very comfortable accommodation. They are often in historic properties that have been lovingly restored where you'll be reserved a warm and generous welcome and enjoy mouth-watering home cooked fresh cuisine. Transfer from Bordeaux (station or airport) at start of walking holiday and back to Barsac train station at end of stay, where required. 7 night's accommodation in a mixture of guest houses, hotels and chateaux. All breakfasts, 5 picnic lunches on walking days and 5 evening meals. Full walking notes and maps, transport of luggage between guest houses. Small transfers on 3 days. Travel to Bordeaux, France. Return train trip to Bordeaux and onward travel. Lunches on arrival and departure days plus one other day. 2 evening meals. Drinks and snacks. Any excursions and entrance fees. Travel insurance. The Network is made up of nine major cities located in internationally renowned wine-producing areas throughout the world. The website gives information on each of the member cities, with links to essential organisations in wine, travel, education and business. It also gives you all necessary information about the Best Of Wine Tourism award winners and about the Great Wine Capitals Travel Network. 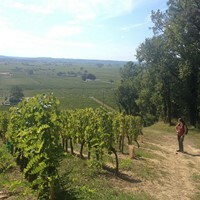 This wine trail self-guided walking holiday in France traverses some of the most famous vineyards in the world. Discover a rolling countryside steeped in history, from its 2000 year old vines planted by the Romans to its wine chateaux and historic villages. 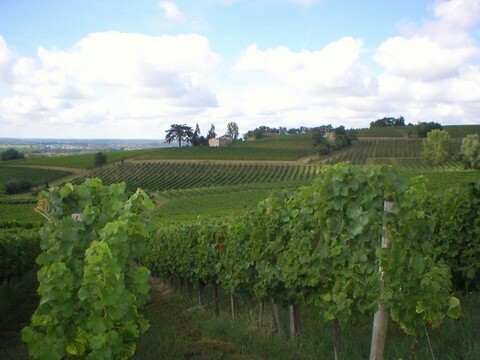 Your walking trail starts by exploring the famous St Emilion vineyards home to some of the most sought after Bordeaux wines. You have the opportunity to have a guided visit of the historic town of St Emilion as well as wine tasting in the Jacobins Convent. Over the course of the next few days you'll pass through several more exceptional wine areas such as Sauternes and Entre-Deux-Mers. Easy walking will lead you through vines and woodland to the mighty Gironde Estuary where chateaux and fishermen's huts vie for attention. Wine tasting visits are possible along the walking trail and at the end of each day you'll be warmly welcomed to your quality guest houses and hotels. This independent walking holiday in the Bordeaux region of France is made up of 5 walks some circular, some walking between guest houses. There are different walking trail options on several of the days meaning that the walking ranges from easy to easy+. The easier days average about 10km with plenty of time for visits and wine tasting. The maximum distance that you will cover in a day is 15km. The amount of ascent and descent is small, adding up to no more than 100m over the course of the day. The walking holiday takes place on good paths and tracks with the odd section on small lanes. 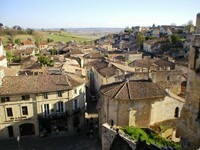 Pick up from Bordeaux or direct to your accommodation in Saint Emilion. 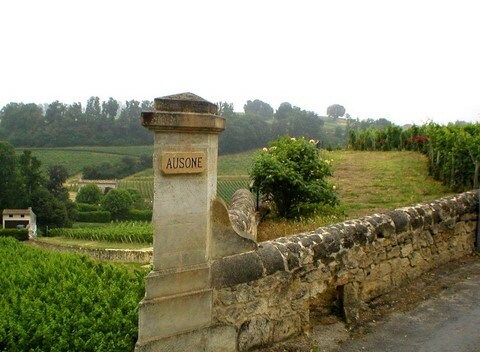 St-Emilion is renowned not only for its wines but for the town itself, which dominates the Dordogne valley from its hilltop position. Private visit and wine tasting in one of the oldest wineries of the region. This will be followed by a guided visit of the town of Saint Emilion which is built in an amphitheatre with troglodyte buildings built into the limestone rock as well as over 70 hectares of underground galleries. Its church is also built into the rock. 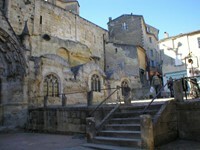 Above ground, medieval buildings line the pretty alleyways along with ruins from older periods. At the end of the afternoon, taxi transfer to Caudrot, in the “Entre-Deux-Mers” vineyard. This day of visits is optional. 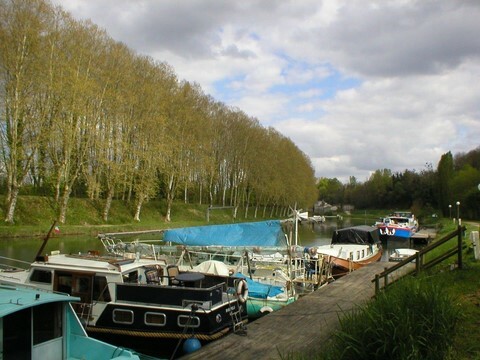 Today's walking trail follows the left bank of the Garonne, where the superior Sauternes wines are produced. 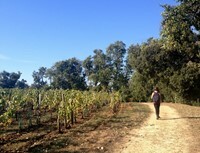 You will pass the vineyards of some of the most famous wine producers of the region. 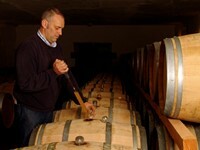 Sauternes is where some of the world's finest sweet white wines are produced. There are some wonderful small communities in this area, so as well as chateaux, there are churches, mills and wash houses set in a beautifully varied landscape of vines and forest. You will also encounter the wild Ciron river, which in the past was used to transport logs from the region. Finish the day with an aperitif tasting in the Château Gravas, a wine producer dating from the 12th century. Accommodation and dinner in the 19th century Chateau de Camperos with its rooms enjoying views over the vines or the park. You can relax in the Jacuzzi at the end of your week's walking trail. Breakfast and transfer to Barsac train station. For useful advice about independent walking and preparing for your self guided holidays please take a look at the articles in our top-tips section. Once you have booked on this independent walking holiday in the Bordeaux region of France, further information about the walking, the region and what to bring, will be sent to you. We do have a web page dedicated to what clothes and equipment you should bring. In addition, our travel shop has direct access to all the top walking and travel retailers. Please contact us if you need any further information. 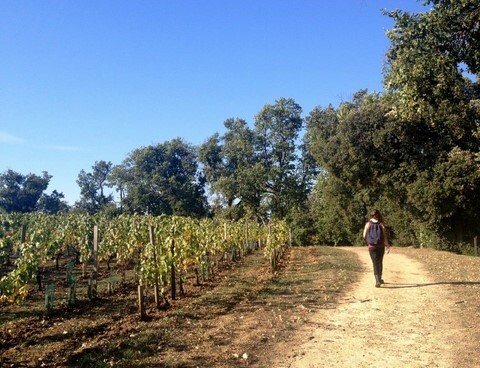 On this independent walking holiday in the Bordeaux region you will be staying in a number of charming, spacious and very comfortable guest houses and hotels full of local character. All rooms have private bathrooms. Examples of the guest houses are shown below. The accommodation varies in character between small B&B style guest houses, 3 star country hotels and wine producer chateau hotels in historic manors in the heart of the vineyards. A hearty and healthy continental breakfast provides the perfect opportunity to discover the local specialities such as home-made jams and local cheeses. At midday you will eat packed lunches lovingly prepared by your hosts. Five evening meals will be taken at your guest houses and hotels where you will be treated to fine regional cuisine. On the other two evenings (not included in holiday price) you can eat at local restaurants and in some cases at your accommodation. La Lezardiere B&B Converted from a restored farm building from the 17th century, La Lezardiere is a small guest house located in a secluded and peaceful setting between Saint Emilion and Sauternes. Terrace and swimming pool with great views where you can relax after your day's walking and exploring. Transfers between Bordeaux Airport or train station and St Emilion are included in the price of your independent walking holiday. The airlines Easy Jet, Ryanair and British Airways have scheduled flights from the UK - Bristol, London Heathrow, Gatwick and Stansted - to Bordeaux airport in France. Note: Please check concerning the availability of a walking holiday before booking any flights. If you need further information or would like to discuss any aspect of your travel arrangements, please contact us, we’re here to help you. Eurostar and the TGV provide a relaxing journey from London to Bordeaux St Jean changing at Paris. There is a practical train time leaving London at 8.30am and arriving in Bordeaux at approx 3pm. Please contact us before booking to check for other practical times. 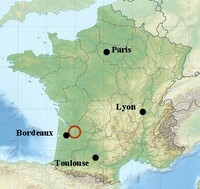 Once in France, the journey from Calais to Bordeaux takes about 8 hours (excluding breaks). Tolls could amount up to 77 euros each way. Controlled parking is available at the airport for 35 euros. Other secure but non-surveilled parking is available free of charge.